Yeshiva heads plan to hold an emergency conference Sunday to discuss last-ditch methods for fighting budget cuts they fear will end Torah learning in many parts of the religious Zionist sector. On Saturday night, religious Zionist yeshiva heads held an emergency meeting with Rabbi Chaim Druckman, one of the leading figures in the religious-Zionist world. They warned that planned budget cuts threaten their yeshivas’ continued existence. Rabbi Druckman expressed support for their cause. Yeshivas should not face cuts so much more dramatic than the financial cuts made elsewhere in response to deficit growth, he said. He expressed support for the struggle to overturn the decision. In May it was revealed that the Finance Ministry plans to slash the budget for yeshivas, causing upset in the religious Jewish community. Now, with the cuts looming, religious Zionist rabbis are trying to avert the decree. So far, they have not found government officials willing to listen. A senior source in the Bayit Yehudi (Jewish Home) faction told the rabbis, “The situation is not good. We are not able to change the decision, and the cuts are supposed to go into effect soon. “I understand that this is a death blow to the yeshiva system,” the source said. 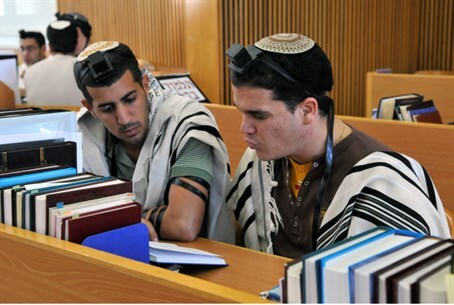 It is the religious Zionist sector that hosts the Hesder Yeshiva system of the IDF, which enables religious Zionist soldiers to integrate Torah learning with military service over a three-year period. A significant number of Hesder soldiers in the program have become officers in the IDF, and are cited for their outstanding military leadership skills by the Israeli defense establishment.